Britain's Thatcher An Unlikely Icon For American Conservatives : The Two-Way A woman hailing from a place many U.S. conservatives once viewed as a hopeless bastion of liberalism has become an enduring figure for the right. Just as Ronald Reagan helped move conservatism from the fringes of U.S. politics, Margaret Thatcher helped do the same on the international stage. U.S. President Ronald Reagan and British Prime Minister Margaret Thatcher in 1987. At the end of the 1970s, "a lot of conservative intellectuals in the United States thought Europe is lost and that America is next," says Arthur Brooks, president of the conservative American Enterprise Institute. "Thatcher's voice came out of the wilderness and said, 'Freedom matters.' "
Her rise was equally improbable because of her gender. She was her country's first female prime minister, a possibility she publicly doubted just six years before occupying No. 10 Downing Street. I think that it was a synergistic, wonderful coincidence that they were coming at the same set of ideas from arguably the two most important countries in the developed world. Reagan called her "the best man in England," and she decried notions of feminism as being the sole purview of the left. Writer and campaigner Natasha Walter has written that Thatcher "normalized female success. She showed that although female power and masculine power may have different languages, different metaphors, different gestures, different traditions, different ways of being glamorous or nasty, they are equally strong, equally valid." Thatcher once quipped that "well behaved women seldom make history" and remarked that "in politics, if you want anything said, ask a man. If you want anything done, ask a woman." Just as Reagan helped move conservatism from the fringes of American politics, Thatcher, with her wit and intelligence, helped do the same on the international stage. "I think that it was a synergistic, wonderful coincidence that they were coming at the same set of ideas from arguably the two most important countries in the developed world," Brooks says. "It's true that they borrowed from each other liberally because they were comrades in arms," he continues. "While Reagan would've been Reagan without Thatcher and Thatcher would've been Thatcher without Reagan, the two reinforced each other. They gave the impression that an in-your-face conservatism that stressed individualism, smaller government, anti-unionism, privatization and deregulation in the economy and a defiant stance towards the Soviet Union was on the march globally, that it had the force of history behind it." To that end, each sought to dismantle what they saw as the welfare state and to clamp down on what many conservatives viewed as the overreach of labor unions. Regan moved against the air traffic controllers' union, PATCO, in 1981, while Thatcher went head-to-head with, in the words of The Wall Street Journal, "Britain's all-powerful trade unions" throughout the 1980s. She "privatized state-run industries, governing with a take-no-prisoners style that earned her both admiration and dislike," the Journal says. "They were really working off the same playbook," Brooks says. In her memoir, The Downing Street Years, Thatcher recalled her first meeting with Ronald Reagan, in 1975, when she was leader of the opposition and he was governor of California. "Above all, I knew that I was talking to someone who instinctively felt and thought as I did," she wrote. Luke Coffey, who was an adviser to the British government before becoming a Margaret Thatcher Fellow at the Heritage Foundation, says she was a wellspring of inspiration to the American conservative movement. "She has shown and continues to show that if you stick to the principles of individual freedom and free markets, you can overcome the naysayers," he says. That determination was exemplified by one of her most famous lines. In 1980, as many wondered if she would make a U-turn in response to push back against her economic policies, Thatcher said: "You turn if you want to. The lady's not for turning." NPR's James says: "In a way, the current Republican Party, with its allergy to compromise, is much more like Thatcher than Reagan. She wasn't into compromise. 'The lady's not for turning,' wasn't a mere turn of phrase for her." Liberal commentator Peter Jenkins has written that Thatcher had "changed the political map and put her country on its feet again." "She did all this with ruthlessness and much injustice and at a high cost in human misery, but she did it," he wrote. 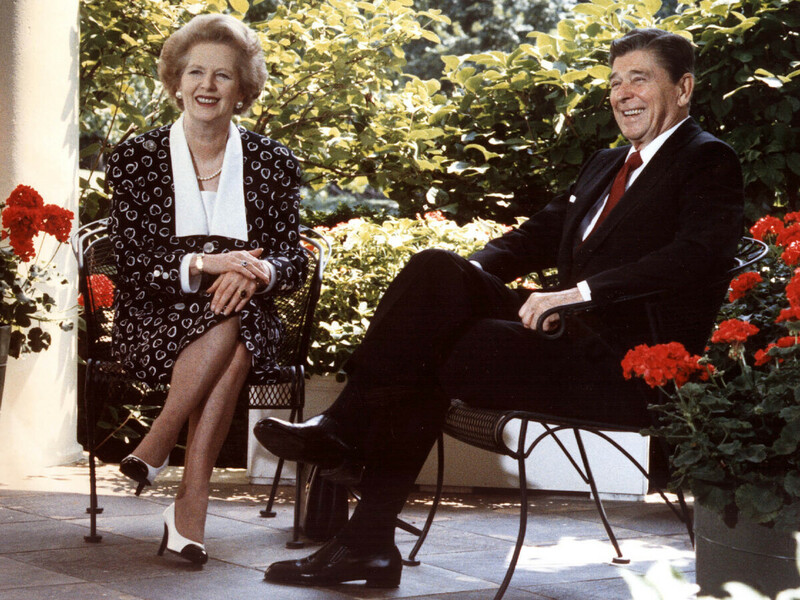 On the international stage, the personal relationship between Reagan and Thatcher, which predated either of them becoming national leaders, blossomed into a "special relationship" between the two countries that was reminiscent of World War II as President Franklin Roosevelt and Prime Minister Winston Churchill worked in concert to defeat the Axis powers. "I would say there is a straight line between the relationship that formed between Reagan and Thatcher and the one that persists between any American and British leader today," Coffey says. But that relationship had worn thin in the intervening years. When Thatcher and Reagan assumed power, "the United States and the U.K. were going in totally different directions," Brooks says. "The U.K. was more aligned with the ideology of Europe than with the United States at many points leading up to 1980." The touchstone event that came to symbolize the new relationship came in 1982, when Argentina's military junta occupied the Falkland Islands, a British territory that Buenos Aires claimed as its own. Thatcher responded militarily, and the U.S. backed her. "Thatcher has said that without help from the U.S., including U.S. Sidewinder [anti-aircraft] missiles, Britain would not have been able to liberate the Falklands," Coffey says. That support was reciprocated when the U.S. bombed Libya in 1986. Still, there were a few rocky patches. During the Falklands War, Reagan called Thatcher to suggest a cease-fire. She refused. "This conversation was a little painful at the time but it had a worthwhile effect," she later wrote in her memoir. Thatcher also wrote that she felt "dismayed and let down" by the 1983 U.S. invasion of Granada, which ended a left-wing coup in the former British colony. She and Reagan are often credited jointly with helping bring the Cold War to an end (even as Soviet leader Mikhail Gorbachev seems to get the short shrift from history). Thatcher's imprimatur, placed on Gorbachev shortly after he became Soviet premier — famously remarking that she liked him and felt "we can do business together" — helped win over a skeptical Reagan. And after Saddam Hussein invaded Kuwait in September 1990, Thatcher attended a conference with Reagan's successor, George H. W. Bush, who was undecided about how best to act, according to Vanity Fair. She told Bush: "Look, George, this is no time to go wobbly!" In her final years, Thatcher devoted her time to setting up a foundation, but it closed in 2005 due to financial difficulties, the same year her daughter, Carol, revealed that her mother suffered from dementia. Thatcher also wrote her memoir and made various appearances, including at Reagan's funeral in 2004. Reagan's widow, Nancy, said in a statement Monday that "my husband and Lady Thatcher enjoyed a very special relationship as leaders of their respective countries during one of the most difficult and pivotal periods in modern history." Nick Robinson, the BBC's political editor, sums up Thatcher's controversial legacy. Thatcher was "the dominant figure of post-war British politics," he says, adding: "Love her or loathe her, Margaret Thatcher shaped this country as few others did." Update at 3:35 p.m. ET: Quotable Quote? We're now doubting whether a quote we attributed above to Baroness Thatcher ("well behaved women seldom make history") was ever actually uttered by her. The quote seems to originate with historian Laurel Thatcher Ulrich, who wrote a book titled Well-Behaved Women. It seems likely that several websites attributing the phrase to the former British prime minister are a conflation of Laurel Thatcher Ulrich and Margaret Thatcher based on the similarity of their names. (H/T to our eagle-eyed copy editor, Amy Morgan).